Well, I have to say that was pleasant to watch. None of this stress stuff that's been happening with Arsenal games of late, but a genuinely solid performance from players who really looked like they wanted to win. Ozil's goal was awesome. Perhaps not the most spectacular goal of all time but a goal that will do him the world of good. Everyone, including myself has been questioning his effort a little bit in the last few games, but not yesterday. His runs were effective yesterday, but it was his defending that stuck out to me the most. The googlie eyed German legged it all the way back on one specific Everton counter attack (something they were quite good add) and made a fine tackle just inside the box. The only thing that was different with the Ozil yesterday was the effort. It was most certainly there against Everton, and that's all we really ask, right? Obviously Alex Oxlade-Chamberlain got the memo about showing up today, because once again he was one of our best and most exciting performers of the pitch Saturday. Every time he touched the ball it made me straighten my back and take notice, he's just got that bit of electricity and flair that you know he's more than capable of making something happen. Yeah, he lost the ball more than a couple of times, but every single time he chased it down and made sure he reclaimed possession. He's got to be picked for England in my opinion, especially with Walcott most likely not making the trip to Brazil. The Ox sat on the sidelines the entire season after getting injured during the first game, and has returned with the fire and desire you can only hope for from one of your teams' players. It's awesome to see him turn into a legitimate Arsenal player and no longer a hot prospect or potential talent. He's contributing to the team now, and has been one of our best players the last few weeks. A trip to Wembley for the FA Cup semi-final will go some way to motivating this group of players to end the season on a high note. A loss against Everton could have proved disastrous for the rest of our season. As is stands now, realistically we've got to start preparing ourselves for a fight to finish in the top three, as winning the Premiership is coming less and less of a reality. However, if we perform as we did yesterday against the Man Cities and the Chelski's then we might be in for a great finish, but you and I both know games against the 'big teams' are usually made more difficult by our timidness and lack of those hairy things called balls. I hope Wenger and his boys prove me wrong. There was some other disturbing news this past week regarding Bacary Sagna and his rather strange contract situation. Nothing is official yet, but rumours are starting to float around (a bit like old farts float around) about Sagna declining to sign a new contract and instead opting to survey his options at the end of the season. 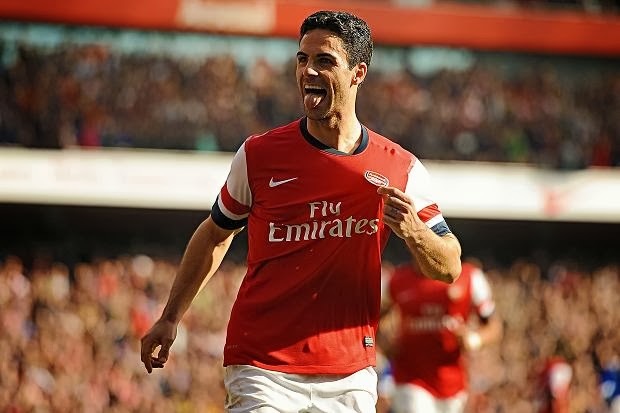 Come this summer he'll be out of contract so this could well be his last season as a Gunner. A rather sad one really, as he's been by far and away our most consistent player in the last seven years, the first name on the team sheet for me. Carl Jenkinson is a little raw and needs time but he's not a bad right back at all. We just think he's a bit shittier than he is because we're so used to having Sagna flying up and down our right wing. After so long it'll be some big shoes to fill for whoever we decide to plant in that spot. I think you've got to put it down to a couple of things; It sounds like he wanted a bit more money than we were offering, and personally I would have offered him whatever he wanted. Granted, he's into his thirties and Arsenal are not a club that treats over-thirty players that well when it comes to contracts, with their policy of only offering one year contracts, but this is a guy that's played the vast majority of games since he's been here at Arsenal and rarely, if ever disappoints. I think the fact that we didn't offer him a contract a year ago might have left a bad taste in his mouth too. Last year he had just come back from a double leg break, which saw him out for months, so when he came back into the squad he was understandably a bit rusty. The club probably wanted to see how he'd make his way back to fitness before they offered a new contract, being cautious that a thirty year old coming back from two broken legs might not be the player he was before the injury. But, come one, this is Bacary Sagna we're talking about here: a player who would (and has!) put his body literally on the line for this football club. It will no doubt be a big shame if he leaves us in the summer, but there is absolutely no doubt whatsoever in my mind that he will give absolutely everything he has in his final games for Arsenal. Who knows, maybe he'll change his mind. Just a couple of days and then off to Germany to play the second leg of our match up against Bayern Munich. We're down 0-2, so almost identical task to the last time we visited the German giants. Except this time winning 2-0 in Germany would send us to extra time and eventually penalties. A situation that doesn't sound that bad, but there's the small matter of getting two goals against Bayern... again. And I don't think Bayern are a team that would fall for the same mistakes twice. An interesting game for sure.